My mind is completely focused on my race this weekend, so I thought it would be fun to have an unstructured, truly "Thinking Out Loud" post today. I usually have a theme for my posts, but I thought it would be interesting to try it out this way. I hope you enjoy! As many of you (hopefully) know by now, I love to cook and bake and generally experiment in the kitchen. However, I never try out drink recipes. For some reason, whenever I test out a recipe I pinned it always turns out horribly, and now I'm afraid to try anything new. But, I kind of want to try to make some of those fall/winter Starbucks drinks at home, and I'm also inspired by my favorite podcast (Girl Next Door) to try ginger beer cocktails. Does anyone have any fool-proof (and I mean really foolproof) cocktails or hot drink recipes? I'm kind of excited for my race to be over so that I can get a better cross training routine. To be honest, the past few weeks I've really neglected the gym in general, because I'm worried about being too sore for long runs or getting injured (plus it's been closed for most of the last month for Jewish holidays). Bad excuse, but I think once I'm done training, I'm going to scale back my running to 3-4 days a week instead of 5-6, and add in more cross training. I want to try out new classes at my gym and start swimming some more. I can't wait! Take 21 seconds out of your day to watch this adorable video..I promise it will make you smile! To reward myself for an excellent training cycle, I splurged on a hoodie from Lululemon. I've been lusting after their cozy hoodie jackets for a long, long time and finally decided to treat myself to the Scuba Hoodie III. I'm already in love with it and might not take it off until it's summer again. That's all today because I have to end on lucky number 6 - tell me something random or tell me your favorite (easy) cocktail recipe! Bonus points if it involved Ginger Beer or Apple Cider. Go Cubbies! (sorry Pirates) What stinks, though, it that a team in second place in ALL of baseball didn't even make it into the playoffs. I've heard of some people asking to revamp the system.... anywho. Good luck with your race this weekend! That was a great idea to reward yourself with something you've wanted for a while. Did you get the scuba in that grey? i am way too excited about the holiday kits. i was sent one from ulta last month and couldn't talk about it until this month. FINALLY! My friends make Moscow Mules but I don't drink them since I don't drink beer. They love them though. It's ginger beer, vodka and limes. I love Moscow Mules! My favorite mixed drink :) You can make them with nonalcoholic ginger beer if you want to try them..doesn't taste like beer at all! Oh I am so bad at mixing drinks. I didn't start drinking until my thirties so I am far behind in all this stuff and need as much help as I can get! Well, not with drinking as I have THAT down, but drink recipes would be lovely. It seems like it should be so easy..it's all liquids so how hard can it be? But everything turns out weird and I end up dumping it out. sigh. It's the best! So glad I got it. Good luck in YOUR race girl! Mmm LOVE ginger beer. Though don't know any super creative drinks to make with it. But I bet making a mojito with one would be a fun twist. Lime, mint, white rum & top with ginger beer. I like to just mix Crown Royal & ginger beer. Or some spiced rum with hot apple cider. I've been making homemade PSL's, hot coffee, while that's brewing I mix some milk (1/4 cup or so, big spoonful of pumpkin, dash or two of pumpkin pie spice & some brown sugar into my coffee mug, warm that in the microwave til it all mixes together. Then add my coffee. Only downside is the last few sips are gritty and no good. Some of the pumpkin settles to the bottom. But so tasty, and cheap! I'm with you. I'm running the Buffalo Creek Half next weekend, and I'm ready to be done with running for a while. Or at least super scheduled running. It always feels nice to just run when I want to and remind myself how much I enjoy it. I trained for a triathlon during my half training & really enjoyed it. Cross training was BUILT IN to the plan. Longest comment ever, but can't wait to hear how the Towpath half goes for you! A mojito sounds like an excellent option! I haven't thought of that, but it's one of my favorite drinks! Thank you for the recipes..I'll try them and report back :) I'll have to chat with you about integrating tri training with running..I'm hoping to do that soon. Good luck in your race! oh my gosh, that puppy!! hilarious. so freaking cute. i am pretty bad with hot drinks, the extent of my expertise is instant hot chocolate (yum). cocktails i'm fairly good at, i pretty much always mix some sort of fruit juice (pineapple, mango etc), sparkling wine with vodka or something. it's easy and delicious and i like fruity stuff haha. Instant hot cocoa is always good and easy! I like to add a shot of Baileys as well (as long as I'm not at work...). I feel like I always get proportions wrong and it's either too strong or too sweet...ugh! That sounds nice and simple though. Love a fizzy drink! I must try out those Sephora favorites. It's a good way to see what you like. I'm not adventurous with makeup so it would be fun to try out new products. We can't wait to see you next weekend. And is adorable Selma coming? That video was the cutest! I love holiday makeup sets. Such great value! A month or so ago I got a Scuba Hoodie (2, not 3, which is more fitted) and cannot believe I never got one before. It is so warm & cozy & has been perfect for dog walks on these cool mornings. Like you, I've worn mine nonstop! It really is the coziest! It's the perfect weight for cool mornings, and I love how it looks. Now I want them all! I have been debating that hoodie lately! it's been on my mind for some reason. It's comfy right (I can't imagine anything they make isn't comfortable lol) it's just sometimes I would see it and say but it's thick and doesn't feel like it will move with me. I know I am overthinking it but I think I really want it. It's amazing! SO soft, and it's not too thick that it's stiff, and it looks really flattering on. Definitely worth a try next time you're in a store! OH wow that puppy video is too adorable. I just watched and rewatched. If someone sends you a good ginger beer recipe, please share! I love ginger cocktails! I will definitely share some favorites! I actually just tried one today that was amazing! Equal parts apple cider and ginger beer, shot of vanilla vodka and lime juice. Really good! Currently wearing my Scuba Hoodie :) glad you like it! Ohhh Sephora gets me EVERY TIME. Those lip liners/sticks look great!! 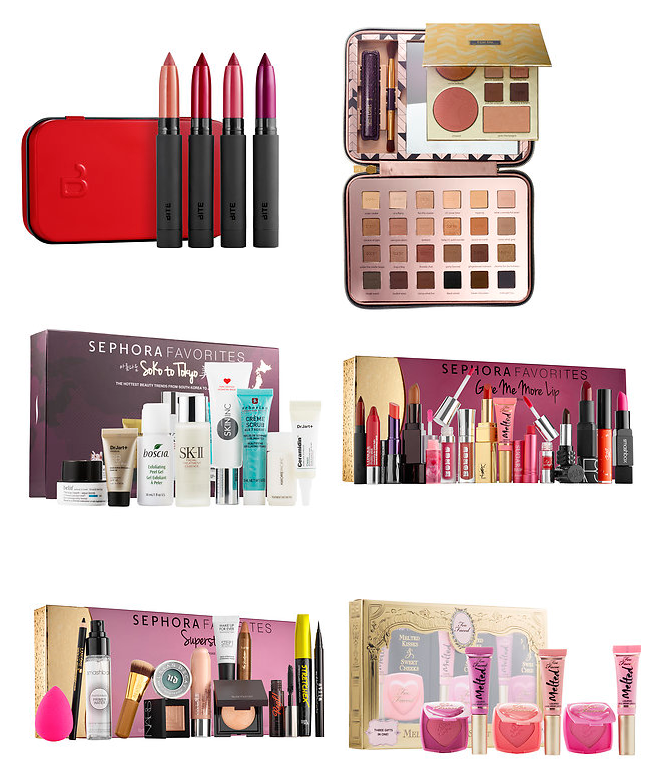 I'm loving how Sephora and Ulta have holiday sets coming out lately!!! !